Press Tyrfing V2 | DREVO :: Game With Cool Tech. 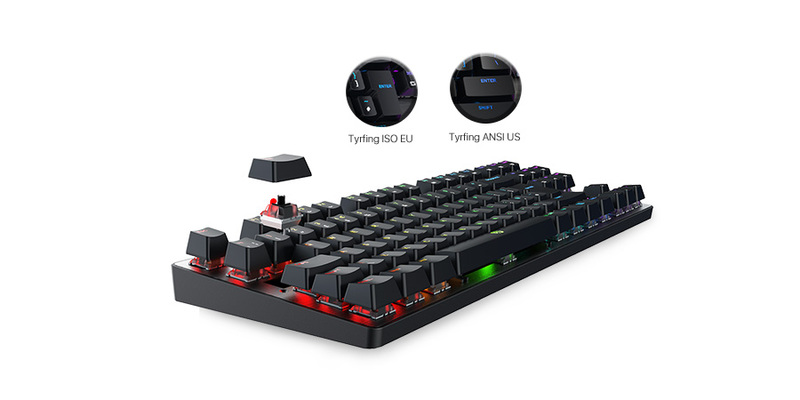 December, 2017 - DREVO, a brand keen on powering the global PC gaming community with unprecedented offerings of SSDs and mechanical keyboards, now announces 87/88-Key RGB tenkeyless mechanical gaming keyboard - Tyrfing V2 with four switch options - red, black, blue and brown and it has six layouts: US, DE, UK, FR, IT and RU. Fulfilling the needs of most gamers, Tyrfing V2's simple design makes it a natural fit for gaming. 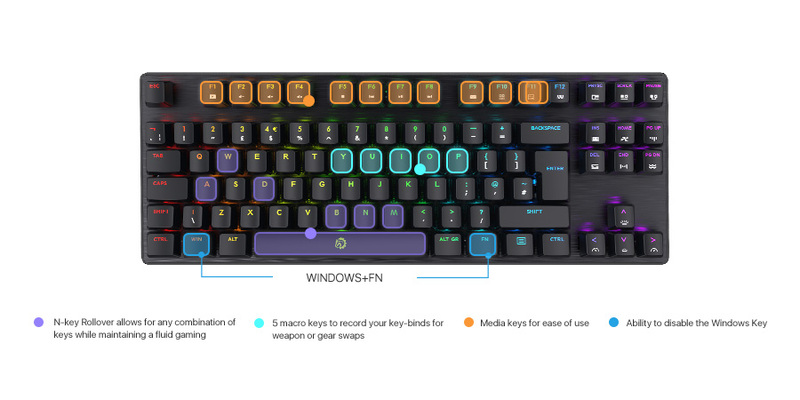 The ten-keyless form factor gives you a compact design while various key functions are integrated to help you dominate your games. Once you start gaming with the Tyrfing V2 keyboard, you'll feel like you've always got a teammate who's got your back. The Tyrfing V2 RGB lighting system features 14 different lighting modes and the 9 highly recognizable colors to match the style of your build. The Tyrfing V2's software allows you to customize the color of each individual key. Other than that, the possibilities are endless with functions like: Macro, Media and Import/Export of configuration. Tyrfing V2 software will open a whole new world of keyboard customization to be explored. To suit gamers' different needs, the durable Outemu mechanical switches used in Tyrfing V2 are available in black, blue, brown and red. 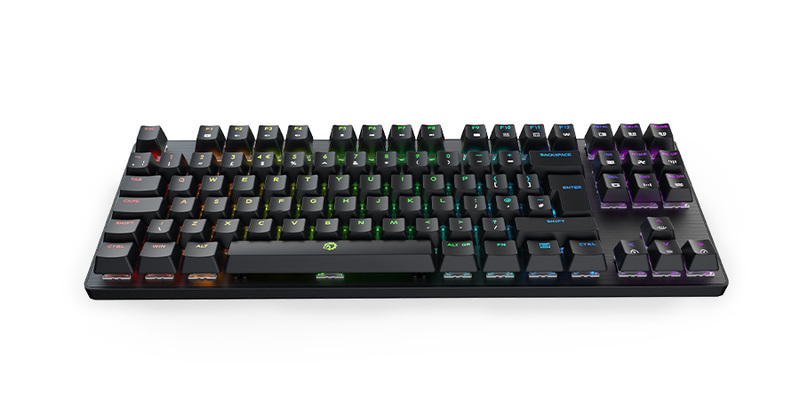 For gamers having different language preferences, DREVO is offering 6 different layouts: US, DE, UK, FR, IT and RU. The US version comes with ABS double-shot caps to ensure that the keys don't fade. For the remaining layouts, ABS laser marked keycaps are used to maintain the best combination of touch sensation and RGB Lighting. DREVO supplies high-quality SSDs and mechanical keyboards for PC gaming enthusiasts who are looking for lower cost and improved value. As a fast-growing brand, DREVO comes with the exact same reliability of most renowned brands, but the products are a lot more affordable. 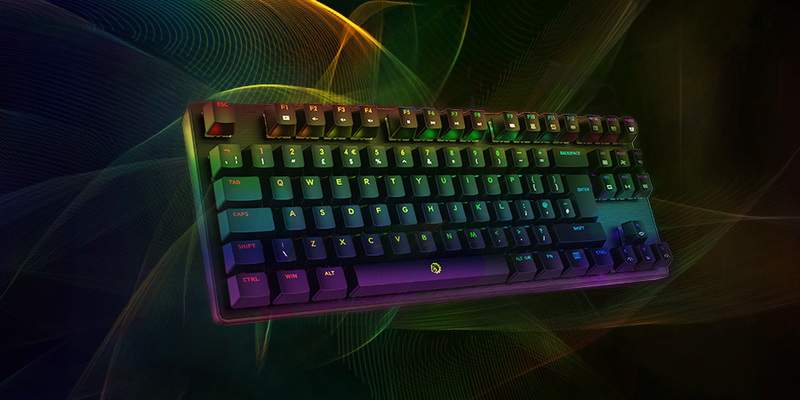 This is an advantage made possible by DREVO’s competitive suppliers and highly efficient production management.